Strengthen and moisturize your hair with Nioxin’s 3-part System 1 Scalp Therapy Revitalizing Conditioner for Natural Hair with Light Thinning. This professional hair care product helps retain moisture balance, providing hair resilience thanks to the BioAmp technology. Lightweight Nioxin density-protecting conditioner is specially indicated for natural hair with light thinning and leaves it fuller looking. 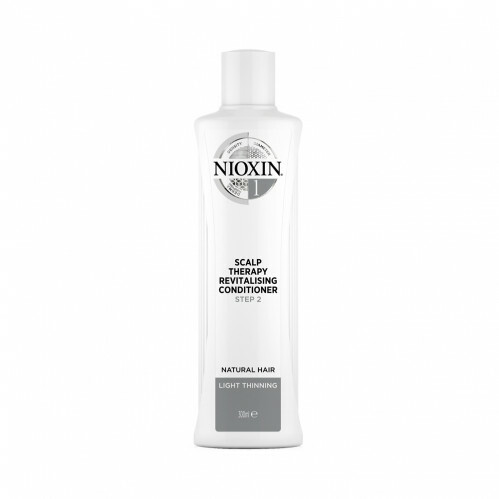 Nioxin Scalp Therapy Revitalizing Conditioner is the second step of a 3-part Nioxin treatment, designed to strengthen the hair and amplify hair structure. Apply from scalp to ends. Leave in for 1 to 3 minutes. Rinse.